Active shooter incidents and other school emergencies require teachers, administrators and staff to become first responders in the blink of eye. A new, free virtual training program from the Department of Homeland Security allows personnel to create and practice response plans for such an incident. EDGE, or the Enhanced Dynamic Geo-Social Environment, School Environment scenario launched in November and is now available for download by agencies and educational institutions. Built on a gaming engine that powers popular titles like Fortnite, EDGE allows first responders and educators to role play complex scenarios in a virtual environment at the same time, improving and reinforcing coordination, communication and critical decision-making skills. 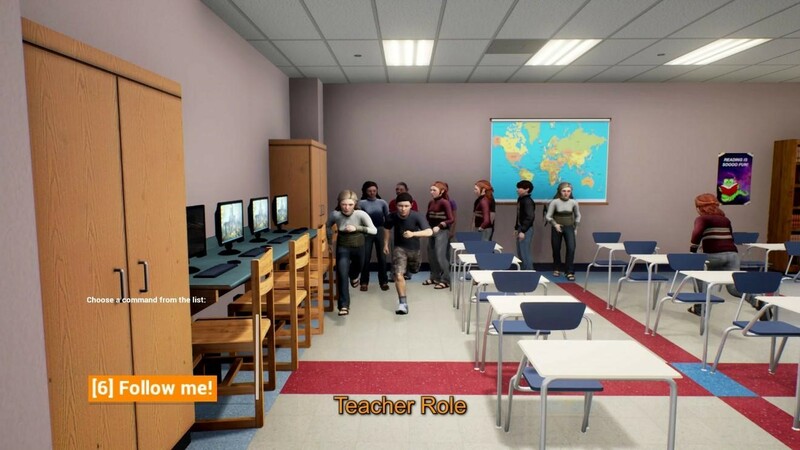 Users control avatars representing their real-life role — teachers, administrators, school resource officers and local law enforcement — to train virtually for a number of scenarios, from custody disputes to potential bomb threats, an active shooter or other critical incident on campus. The software is designed as an enhancement to active shooter planning and training, not a replacement, developed as a tool to supplement existing trainings, like field drills or tabletop exercises; because it is user-driven, it reflects the policies and procedures in place in communities and school districts ­— like Northern California’s Fall River Joint Unified School District. Teri Vigil is the board of trustees president at Fall River Joint Unified, where officials this year held a districtwide ALICE Training (an active shooter civilian response training program) for the rural district covering 1,200 square miles. Conversations about such a training and safety started about eight years ago, she said, as trainings and policies have evolved. “As a board member, I feel that we must address school safety. As we have seen in our country, it can happen anywhere,” she said. “We need to assure the parents of our districts that we are doing everything we can to keep their children safe. With much of school safety technology being quite costly, the EDGE software provides a rare free resource for teachers and school leaders. Additionally, the digital nature of the program can especially benefit rural areas where training resources may be sparse and first responders are often located some distance from schools. A 2017 school violence survey by the Bureau of State Audits found that many schools do not have a plan for an active shooter on campus and are unprepared for gun violence. Mandatory school safety plans also do not require schools have active shooter drills or procedures. Read more about the audit report in a past CSBA blog post. CSBA resources: What actions can district boards or county offices take to improve school safety? Regularly discuss school safety at board meetings. See sample questions to facilitate the board’s discussion on school safety. Learn more about how to respond to a crisis on campus. Find more resources on school safety in the CSBA website’s Governance and Policy Resources section here. Additionally, the summer 2018 edition of California Schools magazine featured an in-depth look at school safety and how school leaders are responding to the issue.